Lawrence Peter Berra was born on May 12th, 1925 in the Italian neighborhood of the Hill, in St. Louis, Missouri area. His father, Pietro Berra had emigrated to the United States from Milan , Italy in 1909. Yogi said, in a Baseball Hall of Fame interview: "My father came over first. He came from the old country. And he didn't know what baseball was. He was ready to go to work. And then I had three other brothers and a sister. My brother and my mother came over later on. 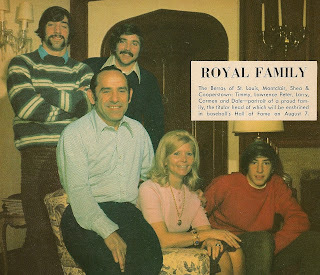 My two oldest brothers, they were born there—Mike and Tony. John and I and my sister Josie were born in St. Louis." Berra was called "Lawdie" because of the way his parents pronounced his name, in an Italian accent. Then came the day while Lawdie was sitting cross legged on the floor of a baseball field & his friend Bobby Hofman said "you look like a yogi sitting like that". The name stuck & he has been called Yogi ever since. Bobby Hofman went on to play for the New Giants (1949 / 1952-1957) winning a World Series with them in 1954 as a utility player. During his playing days Berra inspired the Hanna Barbera cartoon character Yogi Bear with his off beat humor. The local St. Louis Cardinals, headed by team President Branch Rickey, chose to sign Garagiola over Berra thinking he was the better prospect. Some felt Rickey who was on his way to a position with the Brooklyn Dodgers didn't sign Berra in St. Louis because he wanted him in Brooklyn. Eventually he was signed by the AL New York team in 1942. Berra served his country in World War II and was a gunners mate on the famous D-Day invasion in Normandy. 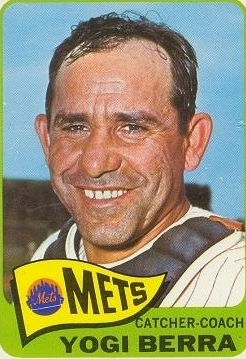 Berra returned to the minor leagues where he once drove in 23 runs in both ends of a double header. Yogi was one of the strangest shape athletes in the game, like my father ( a huge Berra fan) once said, he was shaped like an egg. Yogi came up with the A.L. New York team in 1946 playing under the mentorship of catcher Bill Dickey. Two years later he took over Dickey's uniform number which he made famous & became the team's starting catcher. And although he never led the league in any category, he was one of the game's best players in his era. He was the guy Casey Stengel called "his man". Berra would play 19 seasons, playing in over 100 games for 14 straight years. He would go on to win three MVP Awards (1951 1954 & 1955), play in a record 75 World Series games, win ten World Series titles, play in fourteen Fall Classics, hitting 12 career Series HRs. He set World Series records for games (75) st bats (259) hits (71) doubles (10) singles (49) & games behind the plate (63). 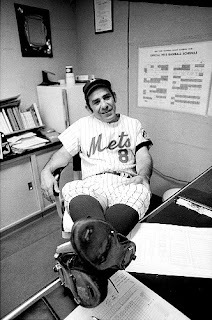 Berra hit twenty or more HRs eleven times, ten straight seasons. He drove in 100 or more runs five times, scored 90 or more runs four times. He batted over .300 three times, hit twenty or more doubles six times. In his 19 year playing career he hit .285 lifetime, with 2150 hits (191st all time), 358 HRs 976th all time) 321 doubles, 49 triples & 1430 RBIs (62nd all time) with a .348 on base percentage. Behind the plate he threw out 47% of would be base stealer's (28th all time) while posting a .989 fielding %. Berra led all American League catchers eight times in games caught and in chances. He led the league six times in double plays, which is still a major league record. He led eight times in putouts, three times in assists, and once in fielding percentage. Berra left the game with the AL records for putouts by a catcher (8,723) and chances (9,520). 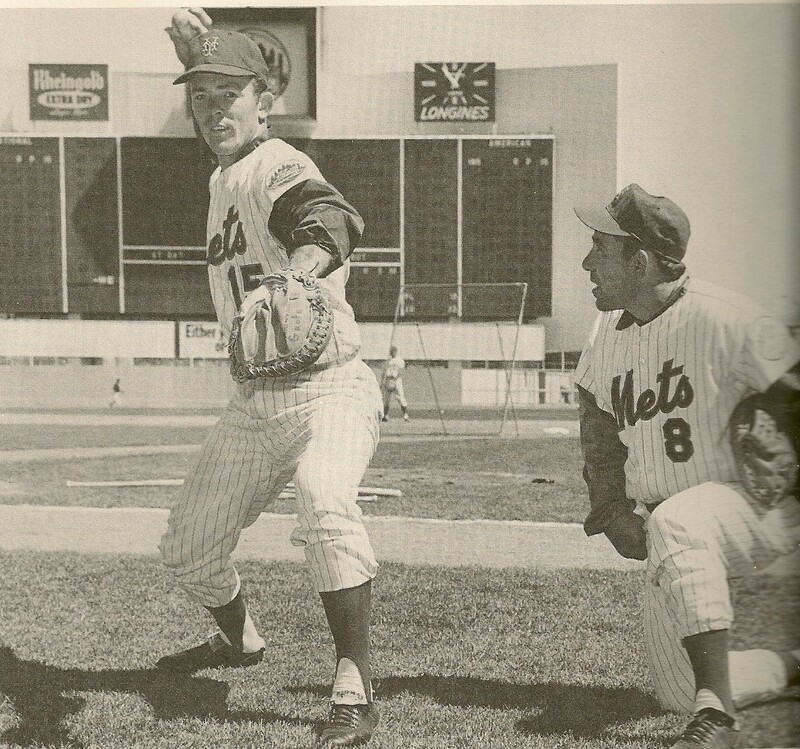 Later in his career he began to play outfield & by 1961 was playing the majority of his time as a left fielder. Just as famous as he is for leaping into Don Larsen's arm after the 1956 World Series perfect game, so is the image of him watching helplessly as Bill Mazeroski's HR went over his head in Pittsburgh's Forbes Field winning the 1960 World Series. In 1964 he was named manager of the A.L. New York team replacing Ralph Houk who became the team's GM. In a famous incident on the team bus, following a loss, infielder Phil Linz was playing his harmonica. Berra ordered him to stop playing, Linz couldn't hear what Berra had said, and asked Mickey Mantle. "He said to play it louder." Mantle said, and Linz did, this went on twice. Now in a rare moment when Berra showed anger, he stomped to the back of the bus and slapped the harmonica out Linz hands. All was forgotten until the St. Louis Cardinals beat Berra's team in the World Series. Berra was fired by his long time club, using the reason that Berra had lost control of the team, dating back to the harmonica incident. 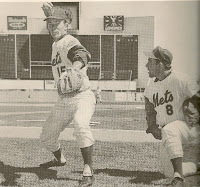 He had brief retirement getting hired as a coach with the New York Mets in 1965.